NAPLES, Italy, Oct 9 2014 (IPS) - In his parody of the Michael Jackson hit “Beat It”, the American satirist and singer Weird Al Yankovic has a parent urging his son to eat the food on his plate, warning that “other kids are starving in Japan”. The parody has raised smiles since it was released 30 years ago, but today “Eat It” could be a battle cry for activists trying to reduce the widespread waste of enormous quantities of food, an urgent concern around the world and no laughing matter. The U.N. Food and Agriculture Organization (FAO) estimates that 1.3 billion tonnes of food go to waste globally every year. Meanwhile, 805 million of the world’s people are still experiencing chronic undernourishment or hunger, Ren Wang, Assistant Director General of FAO’s Agriculture and Consumer Protection Department, told the 11th International Media Forum on the Protection of Nature. “We need a transformative change in our food and agricultural policies to have sustainability,” Wang said. 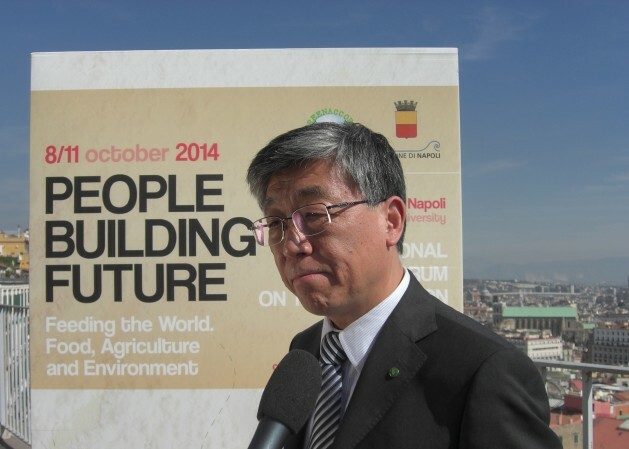 Organised by the Rome-based environmental group Greenaccord and hosted for the second time by the city of Naples from Oct. 8 to 11, this year’s forum – entitled ‘Feeding the World: Food, Agriculture and Environment’ – has brought together experts, journalists and policy makers. It comes as the United Nations’ International Year of Family Farming draws to a close, and as rising food prices continue to pound the incomes of vulnerable groups. Wang said that although global food production has tripled since 1946 and the world has reduced the prevalence of undernourishment over the past 20 years from 18.7 to 11.3 percent, food security is still a crucial issue. The food that goes to waste is about one-third of current global food production, so expanding current agricultural output is not necessarily the answer. In fact, the world produces enough food for every individual to have about 2,800 calories each day, according to scientists. But while some people are able to waste food, others do not have enough. Even if waste and hunger might not be directly related, there is unquestionable inequality in the world’s food system, said Gary Gardner, a senior fellow with the Worldwatch Institute, a research and outreach institute that focuses on sustainable policies. “In wealthy countries, food waste often occurs at the level of the retailer or consumer, either at the grocery store or at home where a lot of food is thrown away,” he told IPS. Food losses and waste amount to roughly 680 billion dollars in industrialised countries and 310 billion dollars in developing countries, according to the SAVE FOOD Initiative, a project involving the German trade fair group Messe Düsseldorf in collaboration with FAO and the U.N. Environment Programme (UNEP). In Europe, the vast quantity of food thrown out by supermarkets has sometimes sparked public outrage, especially in countries where it is illegal for people to help themselves to the rejected items. British supermarket chain Tesco has acknowledged discarding some 28,500 tonnes of food in the first six months of 2013, according to reports, and in Britain overall, an estimated 15 million tonnes of food is wasted annually. In the United States, agencies estimate that roughly 40 percent of the food produced is discarded in landfills, with supermarkets accounting for much of this. Yet, on both sides of the Atlantic, people can be prosecuted for taking food from dumpsters – a sore point with some activists who have organised public campaigns that offer meals cooked from thrown-away food. At the Naples forum, where experts discussed the social and environmental consequences of food waste, among other issues, Gardner of the Worldwatch Institute described the experiences of activist Rob Greenfield, who has fed himself entirely from food from dumpsters while cycling across the United States. “Many times the food was in packages that hadn’t been opened – whole boxes of cereal, sodas, that kind of thing – that for various reasons had been thrown out but which was perfectly good food to him,” Gardner told IPS in an interview. Tesco and several other British supermarket chains have agreed to a programme of waste reduction, and restaurants in several countries are also taking steps not only to decrease the waste but to turn it into biogas to be used for energy. On biogas, some speakers said that using food or household waste for energy at the local level could contribute to wider environmental solutions, but again the main aim should be to stem the creation of waste. “Food security and climate change have certain challenges in common,” said Adriana Opromollo, international advocacy officer for food security and climate change at Caritas Internationalis, a federation of charity organisations. “At the local level, we have seen where using food or household waste can be a successful strategy. But we have to focus on solutions that are tailored to the particular context,” she told IPS. The ways to reduce waste can begin simply. Some U.S. food services companies found that by providing only plates (without accompanying trays), in school cafeterias, students were encouraged to take only the food they could consume, consequently throwing away 25 percent less waste. Perhaps schools should record another version of “Eat It” for lunch hour. Great new feature length documentary film on this topic called “Just Eat It” made by a young couple in Vancouver, B.C. Canada that decides to spend 6 months just eating food that has been discarded. Perfect for film festivals and schools.